Champagne is the store in which you will find valuable gift you have been dreaming about. 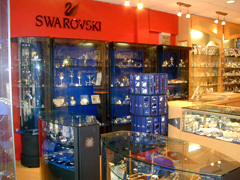 The store has precious collections from linens, Aruban adornments, the famous Dutch Delft Blue and the international Swarovski Crystals. In Champagne you will stroll admiring the beautification of very shiny and colorful decorations and accessories, figurines and collectibles, sculpture and picture frame, ornaments and jewelry. Champagne is the ideal place to find souvenirs and gifts that make you and your home excel and sparkle.